Industry Association recognized the need for independent research to inform policymakers of how legislation and regulations under consideration could impact the industry’s ability to operate. AFIA also realized that constituents have their elected officials’ ears and even the most misguided fears or misperceptions could limit consumer choice and prevent new technology from making it to the marketplace. In 2009, the Institute for Feed Education and Research, a 501(c)(3) public charity, was born. IFEEDER’s mission is to ensure that consumers have access to a safe, healthy and sustainable food supply through 1) funding critical animal feed and pet food research and 2) by highlighting the industry’s positive contributions to America’s food supply in communications. 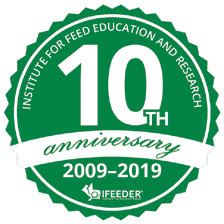 As IFEEDER looks forward to the next 10 years, you can expect to see it continue supporting the industry by sponsoring other critical research projects that provide valuable data to support AFIA’s legislative and regulatory positions as well as finding new opportunities to share the industry’s positive stories with public and policymaker audiences. The animal food industry is a major player in the production of a safe, affordable and abundant food supply. There are more than 6,200 feed mills in the U.S., producing over 236 million tons of ready-to-eat or finished feed each year. Feed represents roughly 60 percent—the number one expense—of the total productions costs for farmers and ranchers raising livestock and poultry. The livestock and poultry industries have been using genetically modified (GM) feed ingredients for more than 20 years. Research to date has shown that these ingredients do not pose any risks to the animals that consume them and that the meat, milk, eggs and fish from livestock, poultry and fish, have the same nutritional quality and safety as products from animals not fed GM ingredients. Currently, livestock and poultry consume a majority of the GM corn and GM soybeans produced in the U.S., and a number of other GM ingredients (e.g., cottonseed, sugar beets, canola and alfalfa) are also included in the ration that is fed to livestock and poultry. In addition, several feed additives are developed from, or produced with, GM technologies. The analysis will better inform how to articulate the value and importance of the use of GM feed ingredients in discussions with policymakers and the public. The IFEEDER Board of Trustees awarded the 18-month research project to Iowa State University. IFEEDER will share the results along with other resources once the study is complete. 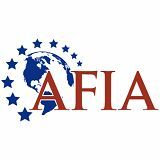 For questions on IFEEDER projects, contact Robert Cooper, IFEEDER’s executive director, at rcooper@afia.org. 21 | Our Industry. Our Passion. Our Voice.